Vialii Garden Services turns 7 years this month. That's 84 in gardener's years. 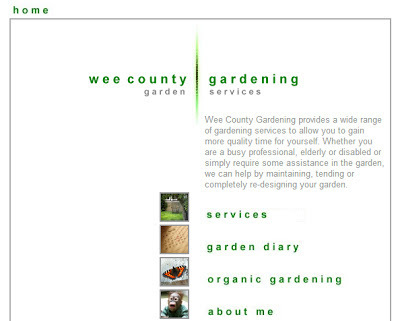 Back in January 2006 after leaving a career as a civil/ structural engineer Vialii Garden Services previous iteration, Wee County Gardening1, was born. From the outset I had a vision of how my gardening business would present itself. For example, a uniform was required as I considered that a service such as this should be presentable, identifiable and professional. I opted for green polo shirts and fleeces with embroidered logo. Whilst our colours have changed over the years we still maintain the uniform with the embroidered branding. In addition, extending the identifiable branding idea, a liveried van was a must and a good looking website was essential. Our website has changed a great deal since then and it’s strange looking back at how it once was. I still like the overall aesthetic of it and i’m still chuffed and strangely proud with what I managed to cobble together with limited IT skills and open source software but I admit now that it does look a bit shabby round the details. Still, it served a valuable purpose and, in my opinion, it was better than having no website2. We still maintain our websites and whilst they are basic in their construction ie. html & tables, they look good, are informative and are well received by the customer. Our website has been the deciding factor for many new clients choosing Vialii over the next gardening company. The business has developed considerably since then although the underlying ethos remains the same. Quality gardening services tailored to the individuals needs. We now have a great garden maintenance team of Corrie and Gordon who tend to our thirty or so regular gardens throughout the year as well as carrying out those one-off tidy-up jobs that come our way too. On occasion I enjoy tearing myself away from our garden designs to help the boys out. I still find weeding to be incredibly therapeutic! As to the future Vialii Garden Services is looking to continue its steady growth. We’re always on the lookout for motivated and skilled people to come on board and help us tend the gardens of central Scotland. We’re continually looking at ways to streamline our processes and improve efficiencies with technology playing an ever increasing role in the day to day running of the business. Vialii's 'fleet'. Hopefully to be added to. So anyway, Happy Birthday to us and best wishes for the future. 1. For those who don’t know, the Wee County denotes the smallest of Scotland’s counties, Clackmannanshire, where I was located at the time. 2. There weren’t many gardening operations with websites then and to be honest not too many have them now. Facebook has changed that to a certain extent but not as much as you might think.